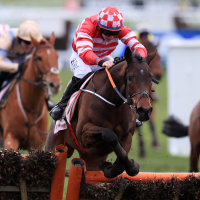 Veneer Of Charm provided Gordon Elliott with a third winner on the second afternoon of the Cheltenham Festival as he survived a late wobble to win the Boodles Fred Winter Juvenile Handicap Hurdle. With the victories of Samcro and Tiger Roll already in the bag, the pressure was off Elliott but this 33-1 winner was harder to find than those two. Elliott also ran Mitchouka, who appeared to be the yard's first string, but he lost all chance when badly hampered by the fall of Lisp down the back straight. Dan Skelton's Nube Negra hit the front after the second-last and appeared to be going best, but Veneer Of Charm quickened up impressively for Jack Kennedy. However, on the run to the final flight, Veneer Of Charm jinked to his right, only to regain momentum and hold off Style De Garde, with Nube Negra third and Paddleyourowncanoe fourth.